Wild, Wild West Baby Shower… for Twin Boys! When it was time for Megan of Cattle and Cupcakes to throw her friend’s baby shower to celebrate the impending arrival of her new twin boys, she knew just what to do. Celebrate the wild, wild times that were about to begin with a cowboy themed baby shower! 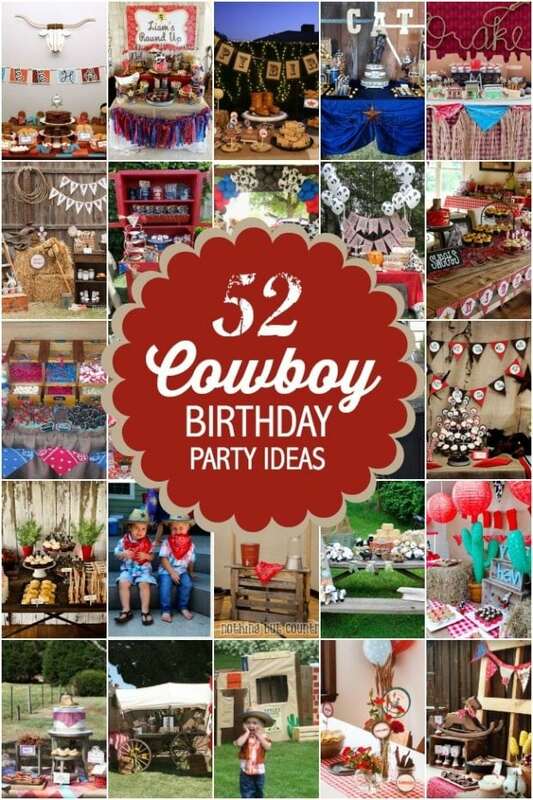 Check out this amazing Boy’s Western Themed Birthday Party. You will not want to miss out on this Kickin’ Cowboy Birthday Party. Megan chose a Wild West Cowboy theme for the baby shower festivities. Her goal was to have DIY baby shower decorations that was not too country and not too cowboy. I think she hit the mark with this darling party. The best part is it took her only two weeks to pull the entire event together. The table is decorated in browns, reds, blacks, and grays. I love the banner hanging over the table and the big stars. The table linens are burlap! There is also a small bale of hay, stuffed horse, and small cowboy hats on the table. I think the printed blanket is a great touch to tie the colors in. The cupcake stand is definitely a highlight of the table! A horse bridle adds to the tabletop decorations. I like that the glass jars with the babies initials are simple but add such a nice touch. It would be easy to fill them with all sorts of treats for the party. The bright red lantern adds a beautiful pop of color while pulling the wild west feeling even more into the table. Plus, it feels very old fashioned. All the party printables are from the The Green Grass Grows Etsy shop. I think the little cowboy cupcakes are darling. They have a great vintage feel! Not to mention how yummy the red velvet with buttercream frosting cupcakes look! Wild west food served at the party included sloppy joes, potato salad, pigs in a blanket, and punch. Guests also enjoyed party favors that included candy corn, peanuts, beef jerky, and cow tales as well as some fun baby shower games.